Bread is the most elemental of food. It’s just flour, water, yeast and salt, and, in it’s most basic form, that’s it. 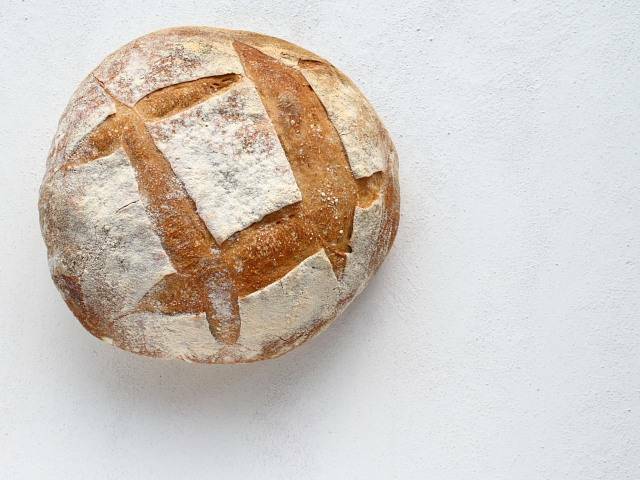 Go ahead and embellish it however you want, but a basic loaf is the stuff of life itself. But, what if you were to go one step more fundamental, and use your own yeast? It’s really very simple, and the bread made from caught and cultivated yeast is special. It’s your loaf, one that you grew yourself. The key to any good sourdough is the starter, and it’s worth taking some time to get it right. It could be a lifelong companion if you look after it properly. A starter, or poolish, or levain is the heart of the loaf. It’s the mothership of yeast that kick-starts the whole bread-making process, and all it really is is a lifeboat for trapped natural yeasts, giving them the right conditions to explode into life, ferment and grow until they’re strong enough to rise a dough. All you need to get going is 150g of wholewheat flour mixed with 250ml of warm water in a large bowl to form a rough batter. The flour will be full of natural yeasts, but a good beating in an electric mixer – ten minutes on a medium speed – will help to aerate the batter and catch as much airborne yeast as possible. At this point, you’re done. Just cover the bowl with a cloth and leave it somewhere pleasantly warm for a day. Mine went into the airing cupboard, and did very well. The next day, have a look. It could be that nothing has happened, and if so, just cover the bowl again and leave it for another day, but it’s likely that there will be some gassy bubbles and the first signs of life. If there are, add another 150g of flour and 250g of water, cover and wait another day. The starter will start to smell as the yeast begins to kick in. Don’t be alarmed – it isn’t going off. For the next feeding, on the next day, discard about half of the starter before topping up with another batch of 150g of flour and 250ml of water, and repeat this every day for four or five days until the starter looks vigorous and the smell mellows out a little, losing its biting edge and becoming sweeter. If all goes well, you should have a fit and healthy starter in about a week, but there are a hundred and one things that can cause this to take longer, so just persevere. So, your starter is ready. 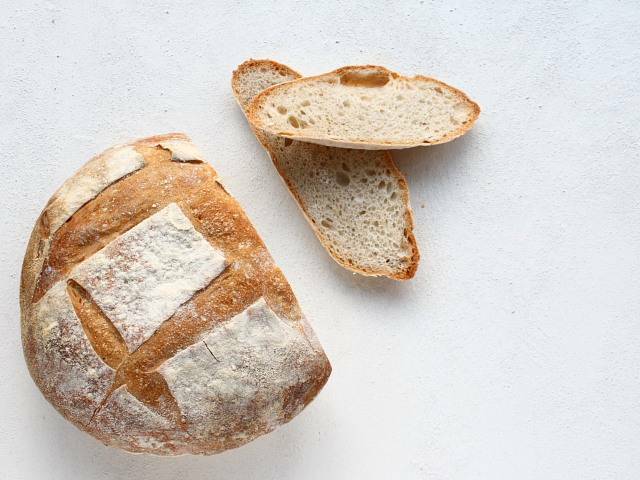 Sourdough bread is made in two distinct stages – incubating the starter even further, and then forming a loaf. The incubation period is important because it allows the starter to grow and multiply so that it’s big and strong enough to rise the dough into a loaf. To get it really fired up, you need to give that little starter you’ve been nurturing all week a massivefeed. Weigh out 500g of strong white flour and mix it in a large bowl with 650ml of warm water and a generous ladle-full of the starter to form what’s called a sponge. Cover, and leave somewhere reasonably warm overnight. When introduced to such a large amount of tasty flour and water, the wild yeast will go into a frenzy and start to multiply and grow like mad. If you make the sponge late in the evening, by the following morning, it will be ready. To make a dough, add another 600g of strong white flour and 25g of salt to the sponge and mix together, either by hand, or preferably, in an electric mixer. A mixer is really invaluable…the dough will be much wetter and harder to handle than a normal bread dough. It needs to be just dry enough to knead, no drier. It’s possible to knead by hand, but it’s all best done in a mixer using a dough hook. Knead for about ten minutes, and if you’re kneading by hand, be careful not to add too much extra flour. Remember that the dough should be wet and sticky. Form the kneaded dough into a nice ball and leave it in a large, covered bowl to rise for about an hour, before knocking it back and letting it rise for another hour. Let the dough rise, then knock it back another couple of times – it needs four rounds, and each time, it will become softer and more silky. Portion the dough into three, and shape each one into a ‘tight round’. To do this, gradually shape the dough into a round, tucking and pulling the dough in on itself underneath, so that you’re left with a tight, drum-like surface. Place each round on a floured wooden chopping board and wrap a floured tea towel or piece of linen around it to prop it up as it rises. This type of support is necessary because the dough is quite soft and fragile….if it isn’t supported, the finished bread will be too flat. The best way to do this is to twist the tea towel into a rope and just lay it around the loaf. Cover with a plastic bag and allow to rise for at least three hours, until doubled in size. The oven needs a good half hour to come to its hottest temperature. Put a couple of baking trays in the oven as it warms up, along with a shallow roasting tin on the bottom for some water. If you have a pizza stone, use it. The trick now is speed. The loaves need to get from their rising place onto the hot baking sheets and into the oven with the minimum of delay, and with the minimum of open oven door time. to gently lift the dough onto the hot tray. is probably a more suitable tool, but I seem to get by. Don’t worry if this move seems to knock the stuffing out of the dough – it will bounce back in the oven. Just before the bread goes into the oven, slash it four times with a small serrated knife, once across each edge in s square pattern. Quickly put the trays into the oven, and pour some boiling water into the roasting tin. Shut the door and stand back, relieved. After ten minutes, turn the temperature down to 200c, or 180c if the crust seems to be darkening too quickly. Bake for another twenty or thirty minutes, so thirty or forty minutes in total, until the loaves are nicely browned and seem hollow when tapped on the bottom. The ‘oven spring’, the way that the loaf domes out when it comes into contact with the heat, as the yeast rapidly expands, should be impressive, and the bread will have quite a handsome look about it. It’ll look like a proper loaf of bread. What of the rest of the starter? This doesn’t end here…you’ve got a starter to look after. Tip the remaining starter into a glass kilner jar and put it in the fridge. Once a week, take it out, discard half and replace with roughly equal quantities of flour and water. Every now and again, beat the starter in a mixer to aerate it. Do this, and your starter could live for years. as good an introduction to baking bread as you’re likely to find. I’ve been thinking about getting back into bread making, but I have always been pretty scared of making and keeping alive a starter. Thanks for breaking it down for me. I’ve made Hugh F-W’s sour dough from River Cottage Every Day – broadly the same as the above, (not surprisingly!) and it is without a doubt one of the most delicious things ever. When I was pregnant, feeding the starter was beyond me but now my daughter is 1, I’m going to make a new starter. My son wasn’t keen on the sour dough when I made it before, he was about 4 at the time but now he can get involved in feeding the starter so he might enjoy eating it more. And if not, all the more for his parents! I found your blog when looking up recipes for Artisan Sourdough Bread. I liked your blog, and your recipe. I make a few changes that suited me and wound up with a great bread that fulfilled my hopes for a really hearty sourdough bread. I am sharing those changes in my blog. Maybe someday you will try to addition of oatmeal flour and oats…I enjoyed it. I’ll be back for more inspiration I’m sure! Does anybody know how much, in grams, is a generous ladle full of sour dough starter, as called by the recipe above ? As I do not want to make so many loaves, can I half the recipe? You can certainly halve the quantities to make fewer loaves, but they also freeze well, if you’ve got the space. You don’t need to be particularly exact about the amount of starter you use – any amount will do, because it’s a yeast, and it’ll grow as the sponge develops overnight. I use a soup ladle, so quite a lot, just to give it a good yeasty boost. I’d think it’s about 100g, maybe 150, but I’ve never bothered weighing it … I adjust the dough as it’s mixed together with a little extra flour if it’s a little loose, or a splash of water if it’s too stiff. This is something that you’ve just got to feel, because different flours absorb different amounts of water, so there’s an element of judgement in play here. Try it a few times, and you’ll get a feel for what good looks like.